This is an indoor/outdoor holiday decoration that has a character move along a line connected between two supporting structures, such as two trees. The character can be a ghost, witch, goblin, Santa Claus with reindeer, snowman, angel, Easter bunny, etc. The idea is based on a “clothesline”. The movement is from left to right, then a slight delay, and then right to left. This movement is then repeated constantly. The distance of movement is selectable from 10 feet to 50 feet. This distance is incremented by means of a distance selection switch. At one end of the “clothesline” is the control module which consists of a DC motor with a pulley, along with electronics which controls the speed and rotational direction of the motor. At the other end of the line is a support pulley for supporting the line. The line has attached to it what is known as the transport. This transport carries the character from one end of the line to the other. See inventionhalloween.com for details. In search of investors to license my patent for production of my invention. See inventionhalloween.com for details. Low cost to produce with a very high rate of return on investment. Powerpoint presentation is available. 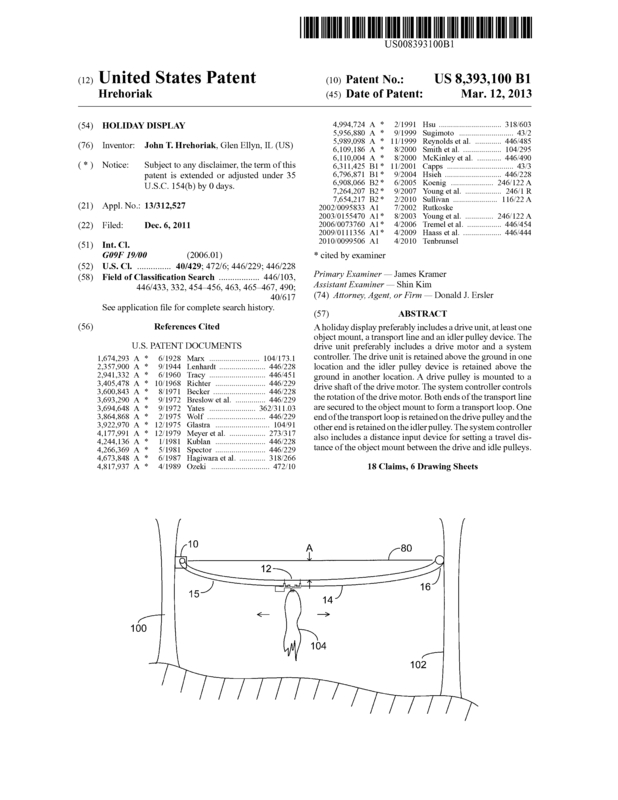 Page created at 2019-04-21 18:55:06, Patent Auction Time.